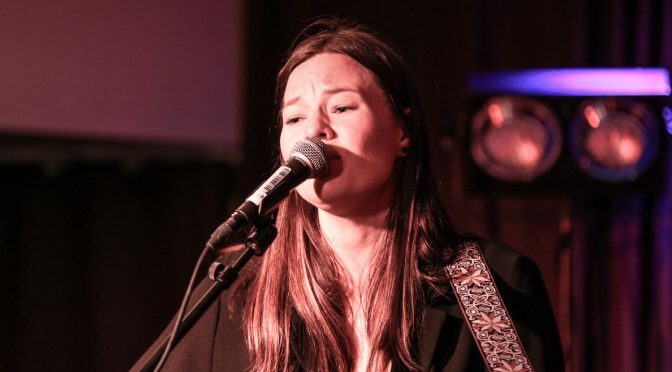 In January, local musician and singer Dina Misund had a successful return to Molde with a concert held at Smuget. After the event, Panorama managed to conduct a short interview with her. – Could you tell us a little bit about yourself, your background, and your career so far? – I´m from the island Otrøya, about 40 minutes driving from Molde. I grew up there with four siblings and my mom and dad. When I was sixteen, I moved to Molde and went to Molde VGS for two years. I always liked Molde, with its view and the nice people there. For me it was two things that mattered; soccer and music. In my last year of high school, I decided to move to Trondheim because I sort of got an “offer» from a soccer team in Trondheim called Kattem (Toppserien). My sister also played football there, so I wanted to give it a shot. So, I moved and took my last year at a private school with sport specialization. When I was 19 years old I had saved enough money to record my own album. Thus, I released a single first, called «This World». It was so exciting! Then came my album «Listen» in 2010. In 2011 I played at by:Larm and Trondheim Calling. I also participated at Eurovision Song Contest in 2014, and the same year I released my album «Nice Distractions». I decided to try to sing in Norwegian, and after writing six songs I released an EP in November, «Nye Spor». – How did you like your concert at the canteen of Molde University College? – I thought it was very fun to come to Molde and sing my new Norwegian songs, to people who talk the same way and can associate with my dialect. I got to meet some family and friends there as well, and people who have followed me and my music since I was a little girl. They are my real fans! I also have to mention the good job what Skyhøyt Live Scene – the organizer – did, it was really professional. – My future plans? To have a lot of concerts, release some singles in 2017, and just really work hard with the music. Reaching out to more people. Writing new songs. Forrige innleggHiMolde meets ChinaNeste innleggMarco Elsafadi: – Skap trivsel, vær optimist!